It has become the season of leaves being scattered by the wind. The faces of all those walking in the shopping district has a tinge of sudden sharpness. The cold acts like a whetstone. Without even fire or hammer, it appears to polish your very nature. While gulping down the sake cup in broad daylight at a bar, he looks out onto the street. Oiva Otara (T/N: >> Oivua Otara <<) stared at the flow of people with glazed eyes. He is a giant. It appears that, not only one chair can’t accommodate his entire body, but that it will break apart under the body’s weight it has to support. He is shallowly sitting on two chairs lined up next to each other in a skillful manner. He wears a combination of a yellow casual dress and a black hood, apparently being the choice of a refined person. But since he is big, he leaves the impression of being a sumo wrestler or an actor with superhuman strength in the end. An old man came out from the bar’s interior with its sparse customers and placed another sake bottle on Oiva’s table. The old man laughs and displays a somewhat large kitchen knife. Oiva also laughed and lightly accepted the sake cup and held it reverently over his head. Although he is now a wanderer, he once served as a swordsmith. 1 or 2 kitchen knives are a trifling matter. He was born as the fourth son of a knight’s household living in a castle. 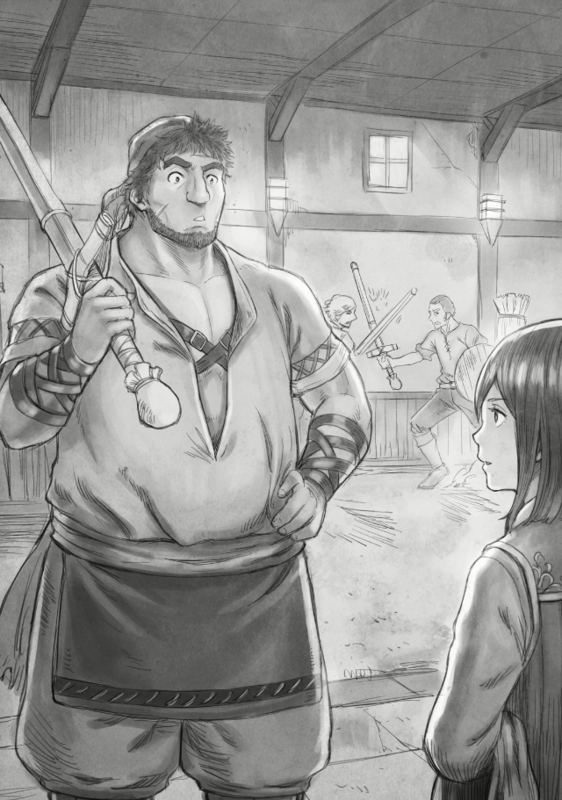 He possesses a career of becoming an apprentice in smithing, after being naturally disinherited from nobility because of his family’s poor conditions. Oiva pouts skilfully shrinking his large build. He sipped the sake with a strangely pitiful appearance as he revealed this. Though he wants to drown in drunkenness, he can’t get drunk at all. And yet, gulping down the alcohol while feeling downhearted, he makes sure to watch the others enjoying themselves without himself being able to blend in there. He continues to observe the bustling on the street. The bar’s owner, heaving a single sigh, returned to the kitchen for the purpose of making snacks to go with the sake for this fine fellow who acts like a big child. There is a town close to the fief’s capital in the territory of Earl Helrevi in the north-eastern part of Asuria Kingdom. Having allowed this area to be dominated by the Eberia Empire during the war, this land is now regaining its prosperity after the “Sacred Flame Festival.” It’s military supplies that are holding up this restoration. The territory of Earl Salmant(T/N: >> Sarumanto <<) in the north-western part of the kingdom has put its local emphasis on military affairs centered around the territory of Earl Peterius. If you go even further west from there, you will enter the “Plain of Wandering Calamity.” Beyond that the dominion of the old enemy, Eberia Empire, is stretching out. The territory of Earl Helrevi, being the region closest to the front line, is playing the important role of providing the supplies. Especially, its horses are excellent. If you go too far into the east you will reach the “Desert of No Life.” There you won’t find any activity of life, with its miasma leaking from the large ice fields in the north. However, in reverse, it is a flourishing area right until you reach the desert. The horses are forged by the wind having slight parts of miasma mixed in, making them tenacious. The area is blessed with a meadow as well. For that reason there is a large demand of horseshoe production for a blacksmith. This town also had numerous smithies doing their business here. On the other hand, there is only scarce work related to swords. But that was fine for Oiva anyway. If he just wants to forge swords, it will be fine for him to head to the west. It is only a matter of wandering. Besides, if it’s horseshoes, there isn’t any problem for it to be the only work of a blacksmith either. The mood that is widely circulating in Asuria Kingdom is unpleasant. The passion for restoration is similar to the fire in a furnace. The prosperity of the people is also similar to the bursting of a spark. However, each of them appears to be engulfed in the detestable color of rust. Two carriages of upper ranks are moving in front of his eyes. Oiva once again scowled seeing the designs decorated on the sides of the carriages. It’s a drawing of an angel helping the hero stand up. This is it. This things are praised extravagantly as fashion and make this society disgusting. He drains the sake cup in one go. It isn’t delicious. The exaggerated grief over the unnatural death of the hero is connected to the vitality of the restoration… If such “drunken sickness” spreads within, even sake will become bad. He can’t bear it after the abuse by the evil man, Salomon. Even something like his desire to work has disappeared. Oiva isn’t amused. Because of that he advanced through the wars according to the army commanded by the hero. And under that command death was wandering about. There was only one person among them saved because of the army led by Salomon. It was a horrible defeat and Oiva remembers the situation at that time even now. No matter where you looked, hundreds of enemy flags were flying. They continued to kill his allies as if relentlessly breaking them into bite-sized pieces. With the path of retreat completely cut off, the many noble commanders gave disarranged orders just causing panic. Though he has a blessed physique, without any horse and armour, as the campaign’s blacksmith specialist, Oiva’s life was in a truly precarious situation. The hero’s troops lacked cooperation with their allies and advanced too far. I don’t understand whether it was something owed to the situation, but it is a definite fact that the location, where the army set up, was extremely foolish. The responsibility for that was with the leader, the hero, Oiva judges. Family honor and individual strength, appearance and titles, all of these don’t matter at all. If you ask, the hero, having ferocious courage, defeated many enemy soldiers. This might certainly be magnificent, but it probably isn’t a too commendable deed as a “soldier.” No matter how many enemies he killed in front of his eyes, the fault of him causing the entire army to be killed due to his bad leadership won’t disappear. In the end it resulted in completely beating the enemy due to the assisting allies. It was Salomon who led that allied group of volunteers. Without a doubt it was Salomon who ruled the battlefield as winner. That overwhelming victory definitely removed the threat of the Eberia Empire. Gulping down one sake after the other, and yet not getting drunk, Oiva slowly walked towards a back alley. Among the tenement houses built in great quantity in the early days of the restoration, there is a single room with a bed in a bad and complicated neighborhood, it is even particularly exposed to the sun. With a small parterre and kitchen. The entire wooden floor is covered if he alone lies sprawling on it. He sleeps. He sulks while sleeping. Passing the period of time, where most people are sweating due to work, he sleeps. At a suitable time once the day turned dark, he slowly got out of bed. Drinking one ladle full of water, he once again leaves the room. His pace is light. Passing across several alleys, he went towards his destination. It was a building looking like a weathered meeting place. He greeted the figures of the men, already drenched in sweat, in front of him in a friendly tone. With equal lightweight equipment, they are holding a wooden sword or a “bamboo-bundled sword” in their hands. The group, forming a circle, apparently meets up frequently to exercise. Getting a particularly thick and long wooden sword from the rack in the corner, Oiva slowly started to do calisthenics for his shoulders and hip. While he was elaborately training his legs and loins, the men began to yell out their fighting spirit and the sounds of strikes resounded. This place is an unauthorized dojo where the town’s martial arts lovers meet up and diligently practice. For the current Oyvua it is the one place he can enjoy himself. Questionably glossing over the number of practice-swings, he participates cheerfully in the training. If it was a military drill of the army, they would wear defensive equipment on top and exchange blows with weapons having a dulled blade, but it is unthinkable for them to have the money to prepare something like this here. They use bamboo-bundled swords. They fixed 4 bamboo pieces into one bundle. For the sake of the blows being buffered, the center of the bundle is hollow. Without defensive equipment, they won’t injure their bones even if they use their full strength. The weapon has literally no weight. There isn’t any weight from armor either. It is indeed unsatisfactory for someone like me who experienced a campaign. While handling the launched sword strikes like a gale, Oiva was happy. For him, who was blessed with muscle strength and constitution, the training with bamboo-bundled swords isn’t a place to display his true strength. It was in the category of half-playing-around, but even so it possessed a charm he was indeed engrossed with. In the first place, it was Oiva who brought those bamboo-bundled swords to this dojo. They were things actually used by the volunteer army for their military drills in the middle of the campaign. He used a chance to borrow one to understand their structure. Its main structural secret is the necessity to fill the bamboo-bundled swords with small iron scrapes in its center. Whether this is a lie or the truth, that’s what Salomon suggested. Although the regular army looked at it and considered it to be 「Feeble」 and thus didn’t imitate it, for Oiva himself, who prefers to use martial arts to push his way through and to kill, the bamboo-bundled swords were fascinating. While also receiving numerous hits to his shoulders and elbows, he gives a clean, single blow to the crown of the head at the same time. It is Oiva who finished the training after handling numerous people. Stopping the competition at a suitable time chosen at one’s own discretion after mutually exchanging opponents was the style of this dojo. However, he is unlucky as there isn’t a next opponent. The fights are at their peak everywhere. At such occasion he withdrew to the vicinity to wipe his sweat with a towel. He noticed a single child standing at the entrance of the dojo. It isn’t particularly prohibited to study by observation at this place, but it is a time where it gradually gets darker. And, the public order of this area isn’t good as well. As he is about to call out to the child with a “Good grief!”… Oiva was startled. With an elegant attire excellently tailored and silky, black hair, he has a dignified look. His age is 5 or 6 years… However, as for all of these facts, his true nature is far ahead. It’s the eyes. Brightly blue and dazzling, with a charming, mysterious glint too. As if having a trace of a cursed sword that has consumed countless souls… a desire for battle reaching the point of danger. Is he human? Or is he something called a demon? Oiva couldn’t do anything other but being dumbfounded. He couldn’t move. As if trying to stand stand on top of a blade that could easily split him in two. I wonder if this won’t happen after all? He made a big sound of gulping down his saliva. As the voice, sounding like a bell, reached him, Oiva suddenly regained his consciousness. In front of his eyes is a child with a strangely mature facial expression showing a polite attitude in his direction. Was I watching a daydream? It was different. Oiva ascertained the sweat of his tightly grasped palms with his fingertips. He points at the wooden box at the side of the entranceway. It’s money paid for the sake of continuing to borrow this meeting place. It is also used to shoulder the costs of materials such as the bamboo-bundled sword which are consumable goods. By the way, as Oiva is the producer of the bamboo-bundled swords, he is exempted from paying the participation fee. Saying this, he looked fondly at the scene of the training. There isn’t any trace of the glint in his eyes, that previously caused me to shudder, any more. I don’t think I saw it wrongly. I fear that he likely naturally stores the blade within the scabbard of his mind, Oiva grasped. And, I can tell that this person isn’t someone living for violence but for military power. He is endowed with power controlled by rules to a certain degree… In other words, he is a soldier. A soldier. It is a ridiculous story if you go by his age, but Oiva, conceited about his own power of observation, sees a mental image of a capable man. It is a gift he polished because of the iron and the flame of a smithy. Even if it’s not needed for a person surviving the ordinary everyday’s life, there is no need to easily misread it as suitable for a person surviving in the gambling room. That young boy has a remarkable character. He might have merits and demerits, but at least this much I can say without doubt. Just, ‘dearly missed sound’? I wonder what he means by that? As far as Oiva knows, the sound resounding in this dojo isn’t the one commonly heard on a parade ground either. It is a sound of rhythmical and continuous clear striking unique to the bamboo-bundled sword. He was confused to be asked in reverse although he expected the question. For some reason it looks like that fearsome young boy knows about the volunteer army. I wonder if his parents joined the campaign? Since I have heard that the volunteer army broke up before the “Sacred Flame Festival,” it is a likely story that those who returned to their home towns are exercising with bamboo-bundled swords. The boy bent his head slightly to one side. It was possible to throw a fleeting glance at the slenderness of his neck. As he started to answer, a scream as if tearing up silk was raised. When it was unnaturally interrupted, Oiva couldn’t help but have a bad premonition. Such things like kidnapping aren’t unusual. As the surface of society is passionately in the middle of restoration, the underside of society can’t erase the violent nature from the time of war. Even if he has time, the young boy dashed at full speed out as soon as he turned is back. Merely catching a glimpse of his facial expression, it was filled with disgust. He might have some knowledge about it? What’s the deal with him? Oiva ponders. I’m not inexperienced to the degree of thrusting my head in each and every trouble of this sort. It is also troublesome if you are targeted by the likes of such groups. But, after having exchanged words, it is unpleasant to overlook a person that piqued my interest. I guess all the more if it is an unusually remarkable character. He looks by accident at the men striking each other as group. They are in an intense ecstasy. They haven’t noticed the incident at the entrance at all. They probably haven’t even realized that there was a young boy here. He would be the same if it was himself exchanging blows. Later it would finish with only taking a tiny space within their conversations that there apparently was a kidnapping in the neighborhood. Picking up one wooden long sword you could even call very thick and also unintentionally being struck with an idea, Oiva also took a somewhat smallish, thin wooden sword and began to run in order to chase after the young boy. boo!! I want the mc’s POV! !